Have you ever wondered what portion of fragrance sales is due to branding and what part is actually owed to the fragrance itself? This thought crossed my mind when I began investigating Rundholz Parfums Sept.21.1966. The fragrance comes in a stylish cylinder with hip lettering (see below). The Rundholz website features casual, avant garde clothing and shoes with an earthy European, yet hip hop, edge. The perfume’s name is mysterious. (I had to wonder if any of Rundholz’s customers are actually old enough to remember 1966. Maybe stylish Germans trend older than stylish Americans.) 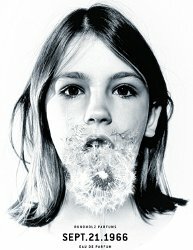 Then there’s the enigmatic, beautiful photo of the girl blowing on a dandelion. Does it have anything to do with the fragrance? We all know it: Nouveau niche fragrances are more common than houseflies these days, and many of them get by — at least initially — through the “cool” factor. A consumer thinks, This brand is cool; this packaging is cool; I’m cool; therefore I will buy this perfume and certify my coolness. More than half the time the perfume is simply not cool. Some brands, like Comme des Garçons, generally deliver. Others — and I’m going to bite my tongue here — don’t, in my opinion. Perfumer Arturetto Landi created Sept.21.1966. The fragrance includes green notes, pink pepper, rhubarb, heliotrope, magnolia, smoky notes, sandalwood, woods, oud and frankincense. Does the perfume live up to its branding? Well, it’s not something you’d likely find in a department store, and it’s a solidly interesting perfume to my nose. Also, it’s not outrageously expensive. But neither is it wildly original, at least to a perfume enthusiast. Sept.21.1966 is a green, sweet fragrance with a foundation of oud, incense and sandalwood. After applying a healthy splash from the sample tube, at first I smell stemmy green and tart, edible flowers — not the usual components of an oud-centered fragrance. These milky-sharp floral notes intensify for a quarter of an hour as the wood builds in the background. Then the fragrance almost caramelizes in a way that hints of immortelle, but woodier. (When dabbed, the oud jumps to the front.) As the fragrance ages, Sept.21.1996’s sweet wood and oud come forward until the perfume wears away completely, at least eight hours later on my skin. The image of the girl blowing on a dandelion head fits the perfume. Sept.21.1966’s intensity and earthiness match the force of a dandelion’s milk, which is bitter, sweet and concentrated while firmly grounded in nature. But it’s also not something you want to drink by the gallon. Sept.21.1966 wears thick and sweet, yet sharp with oud and incense. It has presence and longevity, and you need to be sure you’re wearing it, rather than letting it wear you. I wouldn’t put it on before bed or when I wanted to relax or for dinner out, but I can imagine wearing it on a picnic in the woods or on a hike. Sept.21.1966’s sweet green-sharp oud combination could get nauseating in the heat but might be warming in the winter. As for originality, we’ve smelled fragrances with Sept.21.1966’s character before in L’Artisan Parfumeur Dzongka and Timbuktu, or Aedes de Venustas Signature, just to name a few that aren’t dupes by any means, but that challenge in a similar way. So, does the perfume merit the branding? In Sept.21.1966’s case, for me the answer is a solid “sure, probably.” Sept.21.1966 will be original and intriguing to many of Rundholz’s customers, is my guess. For the rest of us, it’s worth sampling if it passes our way, but we can find our “coolness” in plenty of other bottles, whatever their design. Rundholz Parfums Sept.21.1966 Eau de Parfum is $140 for 50 ml and is available at Luckyscent in the US and First in Fragrance in Germany. I was wondering if it was the brand owner’s birthday, too–or maybe someone in the family. I love your new gravatar! Thank you! It’s basketball season, which unfortunately ends in only two more weeks! GO BIG BLUE!!! I suppose I should ask what perfume you associate with your team, but I’m stumped as to what that might be! Well, I don’t know about advertising and branding, but a math teacher friend I work with used to wear Viva La Juicy as her signature scent because she thought the name was so fun. Each to their own, I guess! It is a pretty hilarious name! It’s almost enough to make a person want someone to ask what you’re wearing just so you can flaunt Viva La Juicy at them. The name is the date of a family membet’s birthday. I didn’t care for this one but I love their first scent, April.03.1968 which is a potent animalic incense. Animalic incense sounds intriguing! The line seems to favor potent scents so far.